A lot of guitar players start playing the guitar merely by being inspired by influential guitarists. I, myself, started developing the interest in guitars from a TV show. The show had shown a footage of what they called as one of the best guitarists playing and shredding on a stage. I can’t remember his face as I was staring at his absolutely mesmerizing performance. I couldn’t look away ( I regret not seeing his face, though ). And that’s when my interest in guitars started – just from a TV screen. Now I’m sure you’ve got your own story on how you picked up your guitar. And it would make us extremely happy if you could share it with us. It’s quite important that guitar player – starters, to be specific – know about the prominent guitarists out there. Not only can they be a source of inspiration, but you can also study, if you will, their playing styles and what makes their techniques stand out from all the skills out there. Lester William Polsfuss – most commonly known as Les Paul – is a self-taught guitarist who was also an inventor. Les Paul invented, you guessed it, the present Gibson Les Paul electric guitar. He stood out for his exceptional playing style such as fretting technique, timing, licks, trills, etc… By the age of thirteen, he was performing as a guitar player, singer, and a harmonica player. His idea of the Les Paul guitar began as an amplified acoustic guitar. Later, he decided to improve upon the guitar by adding strings and 2 pickups to a guitar neck and wooden log. He called it “the log.” The log did face negativity, but Les Paul was content with his invention as it produced the sound he specifically wanted. After a few upgrades here and there, the first solid-body electric guitar was introduced. At first, it didn’t get the attention that the guitar deserved, but when Keith Richards, Paul McCartney, and Eric Clapton – 3 of the most famous musicians at his time – performed with Les Paul’s electric guitar, people started picking it up, making the Gibson Les Paul one of the best-selling guitars to this day. His achievements went beyond the guitar world. Despite the difficulties he had faced, Les Paul has carved an ever-lasting name for himself in the guitar universe. You won’t be forgotten. Stevie Ray Vaughan is perhaps another great guitar player who, despite his brief career, influenced the guitar industry – the blues in particular. Inspired by his older brother, Jimmie Vaughan, Stevie started playing the guitar as a child. He later dropped out of school at the age of 17 to pursue his music career even further. He was the founder and a member of the band Double Trouble, which he called Triple Threat at first, but later changed the name after the vocalist Lou Ann Barton left in 1978. Double Trouble featured the leader Stevie, drummer Chris Layton, and bassist Jackie Newhouse. It was one of the most popular bands in Texas, but it rose even further in fame after David Bowie, an influential singer and songwriter of the 20th century, asked Stevie to perform on his to-be-released album, which he accepted. In 1983, Stevie Ray Vaughan released his debut album Texas Flood, which exploded with attention and success. He continued hitting the charts with Double Trouble for years before he fell into the hole of alcohol and drug addiction, after which he went to a rehabilitation center. After a brief period of inactivity, Stevie and his band performed on couple of tours and Stevie recorded an album with his older brother, Jimmie. However, his career and life were cut short at the age of 35 when a helicopter he was boarding crashed, killing him and a couple of other passengers. Vaughan’s death was an extremely devastating news to guitar enthusiasts. But his name was never forgotten for the achievements and influence he made. James Patrick Page who was born on January 9th, 1944, started his career when he was just a teenager. His first band was Neil Christian and the Crusaders. However, he left the band after a while due to a fever. Page’s second band was the Yardbirds, which he agreed to join after much requests from the band. The Yardbirds met their end shortly after their second guitarist, Beck, left due to heath issues. Later, Page founded a new band with the bassist and keyboard player John Paul John, drummer John Bonham, and lead vocalist Robert Plant. At first, it was called the New Yardbirds, but was later changed to Led Zeppelin. The band did receive some criticism, but the music fans appreciated Led Zeppelin’s works. In 1969, they dropped a new album called Led Zeppelin II, which was a hit in the pop charts, increasing the bands following. They continued to soar the charts the years that followed. Page is also well-known for his charitable work. He was appointed as the Officer if the Order Of the British Empire by Queen Elizabeth II for finding Action for Brazil’s Children Trust. He is truly an honorable legend. 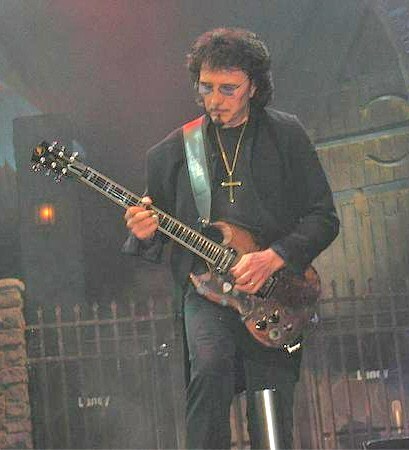 Tony Iommi was born on February 19th, 1948, in Birmingham, England. Hank Marvin and the Shadows inspired him to start on the guitar when he was a teenager. He formed a band called Earth with a few of his school friends. However, shortly after, he had a terrible accident that almost killed his music career. To his deep misfortune, Iommi got the tips of his fingers sliced off by a machine in a sheet metal factory, devastating him. He thought that playing the guitar was nothing but a dream that won’t come true, but then, a friend of Iommi called Django Reinhardt, who had 2 of his fingers missing as a result of an accident, convinced Iommi to pick up the guitar again. Later, Tony returned to his old band, Earth, whose name they changed to Black Sabbath because of another band with the same name. The band was very successful in the late 90’s after overcoming a few hurdles here and there. What inspires me and arguably a lot of other guitar players the most about Tony Iommi is the fact that he didn’t let his disability be an obstacle to his success as a guitar player. It’s extremely common to find guitar beginners giving up the guitar just because they ‘couldn’t play a barre chord’ or some other excuse. When you compare this problem to Iommi’s, you can easily see how silly your reason is. People sometimes fail to remember that there are others having it a lot worse than they do, and, yet, they still complain. Jimi Hendrix is what should be called a true legend. Despite his super short 4-year music career, Hendrix made an impact so big that he is still remembered as the legendary guitarist to this day. His love and obsession with the guitar has made him a superstar in the guitar universe. And he went through so much trouble and difficulties to just play the instrument. For Hendrix, playing the guitar, or getting one at all, was a luxury he couldn’t afford. Despite the many requests from Hendrix to his father, James Allen Ross Hendrix (commonly called ‘Al’ ), he never got one. However, that did not stop Jimi from reaching his passion. Hendrix substituted a guitar with a broom, to which he attached strings. He used to carry it around, even in his school, which prompted one of the social workers in the school to personally ask Jimi’s father, Al, to buy him a guitar; otherwise, as she claimed, he might develop some psychological issues. But his father still refused. Later, in 1957, Hendrix found a ukulele near the garbage while helping his father with his work. And to his luck, the woman who had tossed the uke had agreed that he takes it. Ignoring the fact that it had only one string, Hendrix started to learn the notes and learn songs from other musicians. A few years later, and at the age of 15, he managed to get his first guitar for a couple of bucks. He consistently played and practiced for hours daily, learning and taking advice from musicians. Even in his military service, Hendrix couldn’t not play. However, his obsession got him in trouble for neglecting his duties, so he got discharged. Despite all this, Hendrix still managed to awe guitar enthusiasts with his performances and extraordinary playing skills. He received many awards and honors in just a span of 4 years, which were filled of success and achievements. Hendrix’s death was caused by an overdose in sleeping pills. It was sudden news to all his fans and the guitar world. Now we know that those 5 aren’t the only prominent guitarists out and we fully acknowledge that. Also, who you think is a great guitarist may not be what the other person believes. This subject is highly subjective. Each of those guitarists was, or is, prominent for their unique style and skills. Anyhow, if your favorite guitarist is not in this list, don’t fret about it. Just tell us who s/he is and we will make sure to mention it in our next edition of the Best Guitarists. And don’t forget to tell us why you think they are the best!